This blog post will walk you through the necessary settings to present your learners with a certificate of completion based on a passing final quiz score in a flash course. The yellow highlights on the images below indicate the settings you must change. Each setting is explained below. First take a look at your course settings. Open the course in Unison that you would like to add the certificate to. Click on the "Edit Course Settings" button at the top center of the screen. Go to the "Data Tracking Properties" and take a look at the settings there. Course Completion Status: Select "Completed." 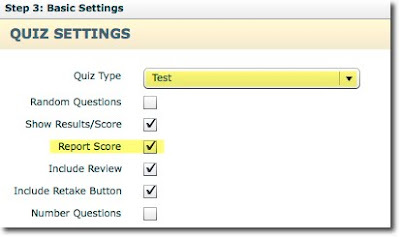 Use Page Complete: (optional) Check this box if you want your learners to visit and complete each page in addition to passing the quiz. You can leave it unchecked if you don't need them to complete each page. Auto Navigation: Leave this box unchecked. Now go to "Step 4: LMS Settings." 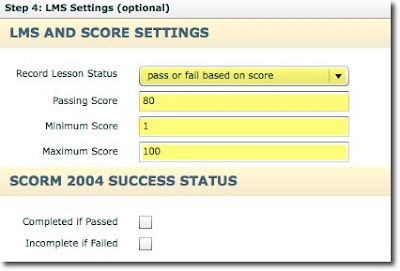 Record Lesson Status: Select "Pass or fail based on score"
The last place you need to check the settings is the certificate page. Prompt for Name: Check this box if you would like the certificate to prompt the learner to enter his/her name before displaying. Restrict Certificate: Check this box. This will restrict the learner from accessing the certificate too early. Restriction Type: Select "Based on LMS Completion"